How bad are things for Whole Foods? The stock is down more than 30% this year and trading around $34.50. That's its lowest level in nearly four years ... and cheaper than six bottles of $5.99 asparagus water! Whole Foods (WFM) is still struggling to convince Wall Street that it can turn things around since reporting sluggish sales growth a few weeks ago. The organic food giant stunned investors by saying that sales actually fell nationwide after the New York City Department of Consumer Affairs said in late June that Whole Foods was overstating the price of some pre-weighed packages at its Big Apple stores. Executives apologized for the pricing snafu and pledged to take action to ensure it doesn't happen again. But the stock has fallen another 5% since it reported results. Last week, a Whole Foods shareholder filed a class action lawsuit against the company in a federal court in Austin. Related: Stick a fork in Whole Foods? 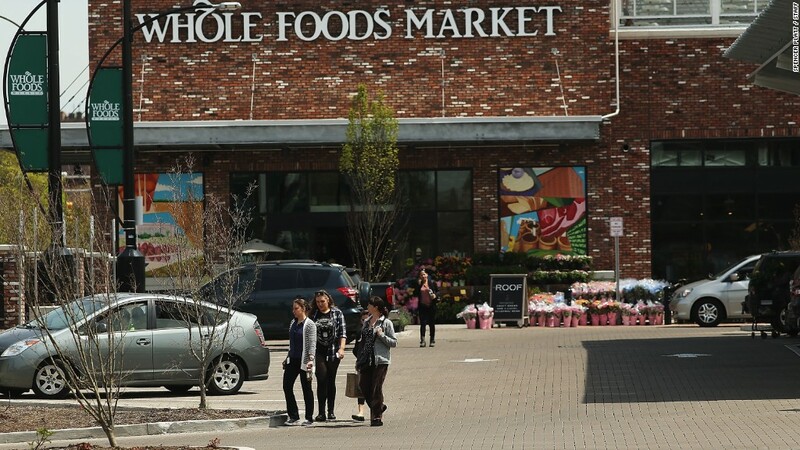 The investor alleges that Whole Foods executives made false and misleading statements about its business operations and failed to disclose that it was overcharging customers in a timely fashion. Whole Foods called the complaint "baseless and without merit," and said it is committed to its "100 percent pricing accuracy guarantee." But the company already seems to be losing in the court of public opinion. The company was ridiculed last week after people noticed that a Whole Foods in Brentwood, California was selling the aforementioned asparagus water -- literally a bunch of asparagus stalks in a bottle of water. For almost $6 each. Whole Foods eventually pulled the asparagus water from its shelves and said that it was a mistake. But the damage was done. John Oliver tore Whole Foods to shreds on Sunday's "Last Week Tonight" on HBO. (With a predictable joke about asparagus making pee smell funny.) Full disclosure: CNN's parent company Time Warner (TWX) owns HBO. The segment ended with a parody ad lampooning the company's Whole Paycheck reputation for ludicrously expensive food. Some of the fictitious items in the ad? Ironically enough, Whole Foods has been aggressively lowering prices lately to try and win back shoppers. There is now a lot of competition for cheaper organic food from the likes of Walmart (WMT), Costco (COST) and Kroger (KR). But the price cuts have hurt profit margins at Whole Foods. Whole Foods also has plans to open a new store format next year -- 365 by Whole Foods -- in some big cities. These stores are expected to focus on younger shoppers and feature lower-priced products. But that's raised concerns about whether the new stores will eat into the sales of existing Whole Foods locations. The company seems to be between that proverbial rock and a hard place. It can't win. It also doesn't help that one of the co-CEOs of Whole Foods is complaining about how the company is being treated. During the Whole Foods conference call with analysts after its earnings report, co-CEO John Mackey claimed that Whole Foods was being unfairly singled out by regulators and the media. He said the pricing error rates at Whole Foods are not much different than other supermarkets. "We do feel like we're victims;" he said. Comments like that make the jobs of late night comedians a heck of a lot easier.